Preheat the oven to 190 C. Grease a 29 cm2 square pan and set aside. In a medium bowl, combine the first 6 ingredients, mixing together with a fork until crumbly; set aside. In another medium bowl, stir together the flour, baking powder, salt and cinnamon. 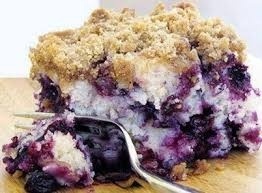 Spread the batter into the prepared pan and sprinkle with the crumble topping. Bake for 50-60 minutes, until a toothpick inserted in the center of the cake comes out clean. Cool, and cut into 9 large squares.